GlobeCore has successfully completed the final trials of the CMM-1CF unit with the processing rate of 1 m3/hour in May. The primary mission of this product is not only filtration, but also removal of water from industrial oil. The unit can process oil with water content of 50% and more. The CMM-1CF can process diesel fuel, kerosene, petroleum, heating oil and other petrochemical products with high water contamination. The unit is based on a fairly simple principle of coagulation. Oil passes through a special filter, where molecules of water form droplets and flow on the surface of the filter into a settling vessel, from which the water can be drained through a valve. 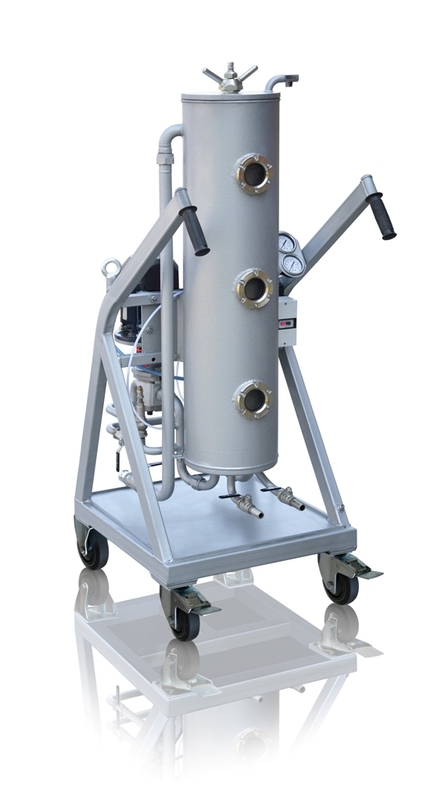 To extend the life of the pump and the main coalescing filter, the unit is equipped with a cartridge filter (with the possible filtration rating of 1, 3, 5 or 25 μm). no heating or chemical influence on the processed oil. For specifications of the CMM-1CF click here. If you are interested in equipment with different processing rate, detailed technical information or pricing, we recommend referring to one of the contacts listed in the corresponding section of our website.